Tri247 went along to the official launch last week of KitBrix (www.kitbrix.com), a new bag for storing and transporting your sporting kit. If you were at the London Triathlon Expo this past weekend, you may well have seen the brand exhibiting. As triathlon grows its great to see new innovative products coming to the market and you can't help but like Robert Aldous, the founder of KitBrix. As well as a strong sporting background, Robert was also in the military and has combined his knowledge well to create a very hard wearing, innovative and useful product. Robert's business partner Lara Morgan was also in attendance, Lara as well as being a successful business women (www.laramorgan.co.uk), has also raced competitively in triathlon so has been able to add her business expertise and triathlon knowledge to the product. 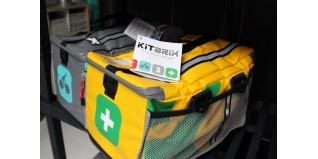 Find out more about KitBrix in this interview with Robert, along with a short video montage from the launch.